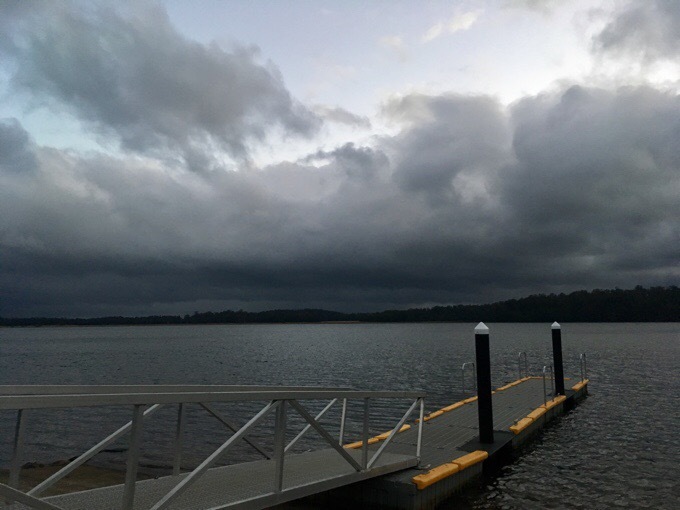 The expected rain kicked in overnight with a good deal of wind as well. There really is no better feeling than that of being inside in a warm cozy bed as rain beats down outside and you’ve just finished a week out on the trail. Given the forecast with some rain on the longer tracks this week, we’ve now switched from heading to the exposed and challenging Western Arthurs next and decided to head to the west coast. We’ve gone back and forth on what to jump to next as we want to optimize weather windows. It’s fun to actually have a choice in the matter and not be in the stress of a forced thru-hike to push through regardless of weather. The east side of Tasmania tends to be dryer, so those are good for us to do when it’s not ideal to be hiking further west. Here’s the map again to get a visual. 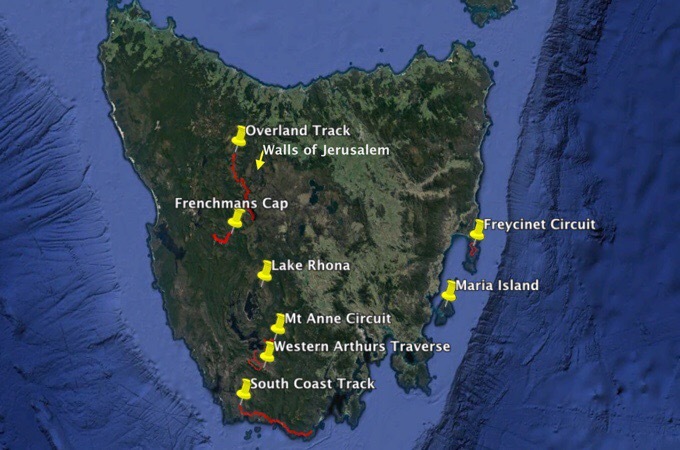 We woke up with the plan of hitting the coastal Freycinet Circuit. 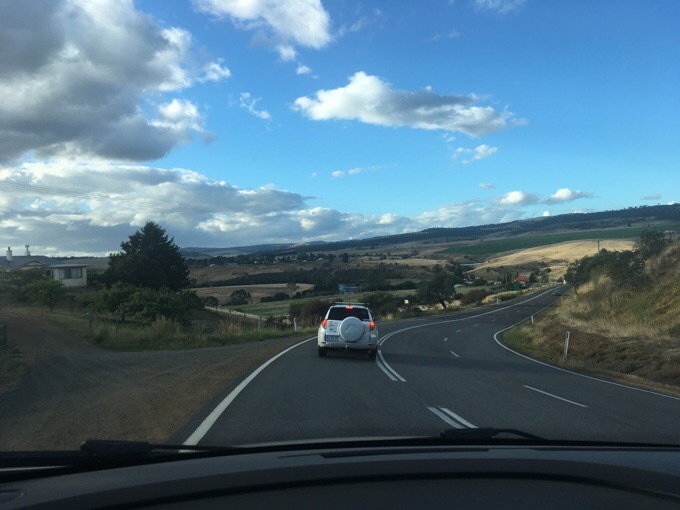 We would need to take the 11:45am bus the two hours to Hobart to rent a car, which is super affordable out here. I was guilt ridden to lounge all morning when I was up at 6am, but it was raining and we had no control over the bus schedule. 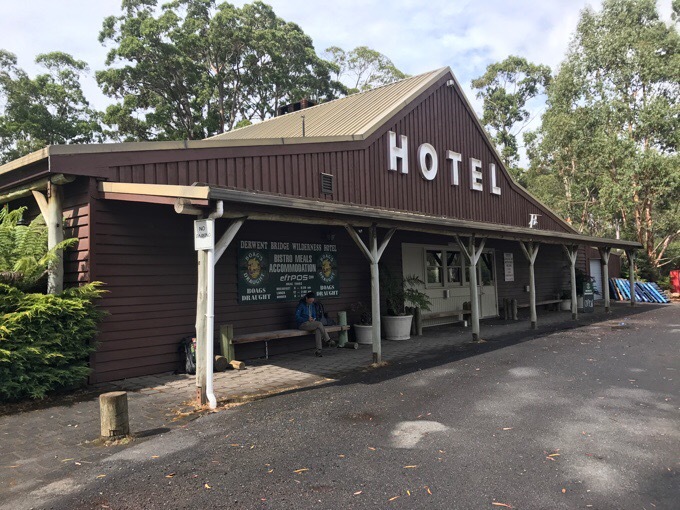 It only runs every other day, and we could have hitched to Hobart yesterday to save half a day, but we didn’t realize this until last night when the weather shifted to change our plans to needing the rental car. Good thing Tasmania is small and jumping around isn’t too time consuming. We both want to optimize our time here and know it’s a bit of a game of roulette with the weather, and we may not get to do everything on our list, so we keep strategizing what order to do things based on the shifting weather. Once I let go of the guilt of sitting still while it rained outside, I huddled up in bed till 10am and indulged in two more episodes of Downton Abbey, which I’m officially hooked on, and finished the first season. Man, how did I ever miss out on this as it was aired originally?! Then we went to breakfast and caught our bus to Hobart. 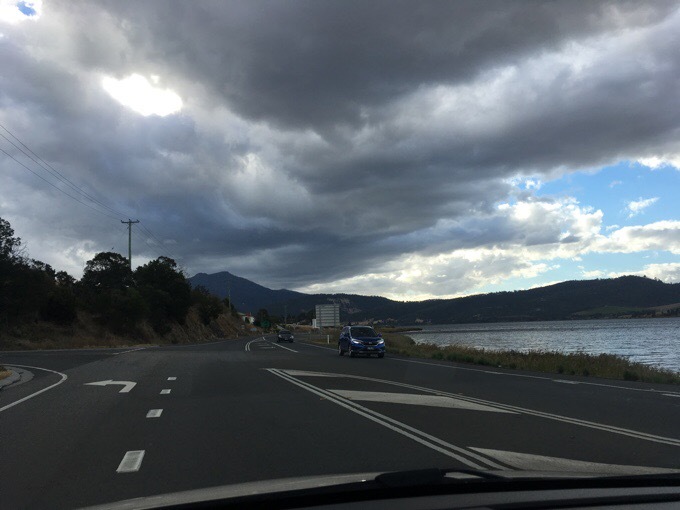 It was a really windy two hour ride to the largest city in Tasmania, but I stayed focused and managed to get minimally nauseated. We didn’t get any photos of Hobart, but it felt like any other city. We did a bit of needed shopping, rented the car, and grabbed plenty of food for what we might be doing with the car. Then we headed not to the coast, but back where we came from this morning. Yep, we changed plans again. 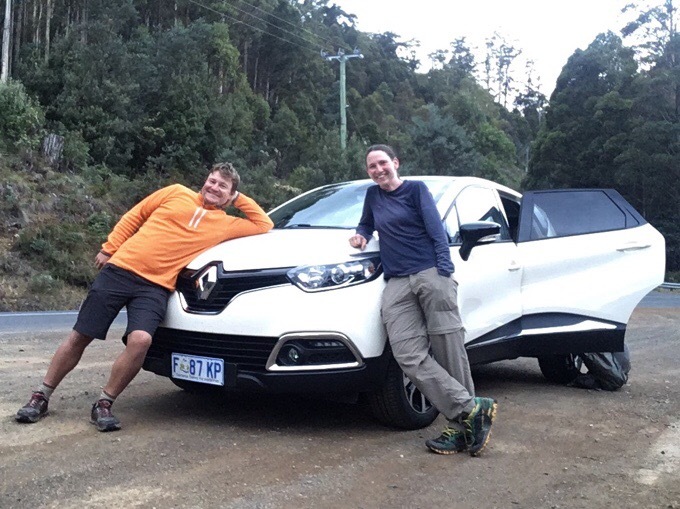 Griggs and I having fun posing with our lucky car rental of a bigger car for the price of the smallest option. Score! While riding the bus, we looked at weather again and decided to make a go for the short hikes in the middle which we prioritize over the coastal Freycinet hike, and which have a good window of clear weather. Looking at the map above, the ones we are aiming to do would be Frenchmans Cap, Lake Rhona, and Mt Anne Circuit. All are short hikes of 1-2 days. Both of us would prioritize these over the coastal hiking, so we decided to do them while we could. Then we will reassess if weather will be clear enough to head to the Western Arthurs Traverse or the South Coast Track. This has been a great way to wind down from the Te Araroa, and also to end what will be 9.5 months of hiking and travel for me. Even if we don’t get the opportunity to do all the hikes on our list, we are totally ok with that. This feels like a vacation and we are having fun with not forcing ourselves into unnecessarily uncomfortable conditions. We did enough of that the last few months! 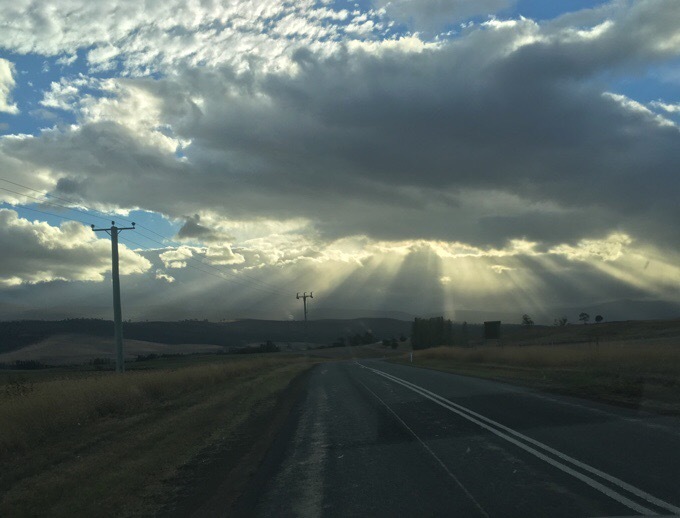 The drive was beautiful with the clouds and sun providing plenty of entertainment. We used the Campermate app and found a free campsite right on the way along Bronte Lagoon. We nailed the timing arriving just before 8pm as it was getting dark: There was just one other camper parked nearby. The view of Bronte Lagoon near our campsites. Once we got our tents up, it began to rain very lightly like a mist and has continued for a couple hours. It’s a soothing sound and I’m trying not to doze off. I have my cozy fleece on and am sure I’ll sleep great tonight. Tomorrow, weather should be clear, and we will do the overnight trip up and down Frenchmans Cap. Excited about this one, and quite taking to the freedom and choice of having a car. We both feel like it’s a great vacation! 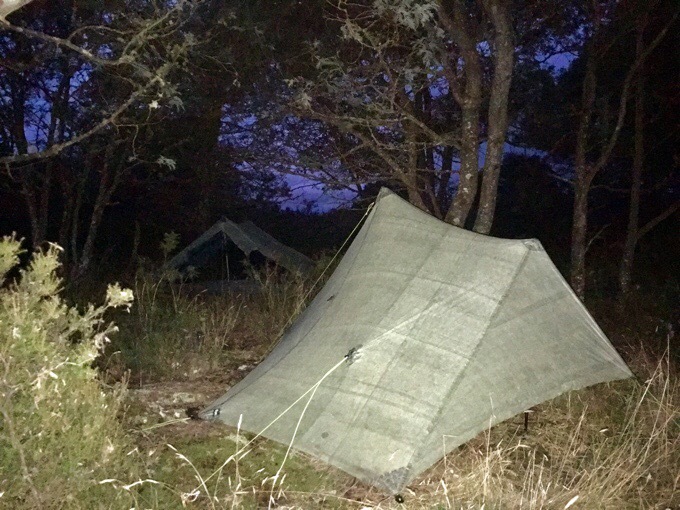 Is that a Cuben tent or is it just the light? If it is it must weigh like a feather. Really great to see you are really enjoying Tasmania Erin (and Griggs) the Te Araroa just didn’t seem to fit well…..but you did anyway. 🙂 It really shows in your story too, a much better read for we armchair bound hikers, well done. It is a cuben fiber (ZPacks). I think having good weather is key for this though. We are getting lucky finally. Any funny stories about driving on the other side of the road yet? Just once Griggs was on the wrong side of the highway and neither of us noticed until another car came a us! Another time in NZ, I didn’t realize I parked on the wrong side of the road parallel parking and an annoyed woman walking by told me I’d get a ticket. I totally didn’t even realize I’d done it! I’ve heard that tourists in NZ are causing serious accidents. I also heard of Kiwis taking the keys away from dangerous tourists. That’s probably why this lady was upset when you parked on the wrong side of the road. Kiwis are the nicest people in the world but there are certain things they will not tolerate. Good on Them! Yeah, we saw tons of it as well. Erin, it is so cool to see you two just taking it all in stride. Over three-quarters of a year of travel. You’re going to have to take a week to rest up once at home; but I bet you are back to work in a day or two! Yep! I arrive at 8pm, so not working the same day (feeling guilty about that) but working the following day for sure! So many trail choices and none of them too far apart to jump around. Good for you – the scenery is beautiful. Enjoy that car too. Erin, as I remember, you get to start decompressing with your sister’s family before any return to work.. Lucky nephews get to hear about your adventures ahead of the other kids you will interact with on your jobs.